The Bangalore Literary Festival opened in true Kamsale folk form, with the Karnataka Janapada Kalavidhara Sangha, invoking Mahadeva. 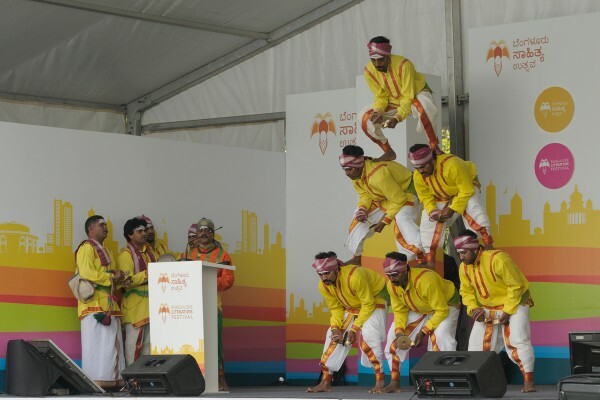 This was done to the accompaniment of traditional musical instruments, including small cymbals, and also some dancing and gravity-defying acrobatics like human pyramids. In the welcome address, Mr. Sampath spoke about the highs and lows of organizing a festival like the Bangalore Literature Festival from the ground up: “It’s a platform for the best minds to come together in a peaceful and democratic manner.” He also drew attention to the festival’s new focus on the Northeast corner of India, aiming to enhance political and emotional integration as well as freedom of expression. The inaugural address was followed by a brief audio-visual presentation about BLF, since its inception, in 2012. Founders, Vikram Sampath, Srikrishna and Shinie Anthony cited the reading culture of Bangalore, as the primary reason for planning the Literary Festival in the “garden” city. Author endorsements of earlier festivals, were also screened. 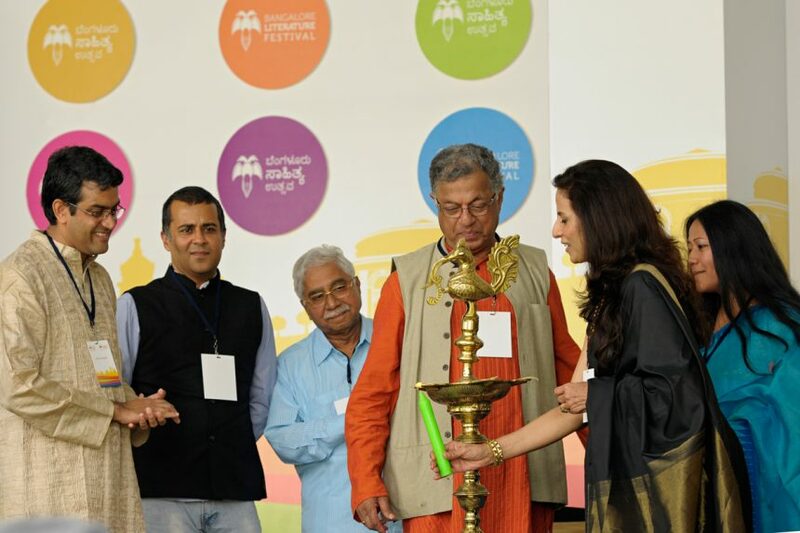 Celebrities on the stage for the inauguration and lamp-lighting ceremony were Girish Karnad, Chandrashekhara Kambar, Shobhaa De, Chetan Bhagat and Vikram Sampath. Vikram also declared the festival open and gave an overview of how the festival came into being. Till date, 200 eminent authors have figured and 150 are expected this year along with a huge audience. All the famous Indian cultural icons who have passed on were remembered, with special reference and tributes being paid to U.R. Ananthamurthy. Vikram hoped that the Festival’s special focus on the North East would in some way do reparation for the fear psychosis created in Bangalore in 2013, resulting in an exodus of the large North-East community from the city. New additions to this year’s Festival include ‘Litmart’, a platform for budding writers to pitch teasers of their scripts and stand a chance to get published. Round the clock screenings of biopics is another new item on the BLF list of exciting activities. “If new writers emerge from Bangalore, our efforts will be truly worthwhile”, Sampath said. Girish Karnad, was his honest self when he said that this is the first time that he was attending the festival, and would be ready to give his impressions, at a later date. Chandrashekhar Kambar remembered the two important icons of Karnataka, the late U.R. Ananthamurthy who is well-known outside Karnataka and the late Yeshwant Chitale, equally significant, but less known. Chitale wrote from Bombay. Shobhaa De lauded the efforts of the organisers in maintaining the independence of the Festival. She appreciated the literary flavour and atmosphere and the fact the organisers don’t give in to the temptation of selling out to turn it into a Carnival. “I’ve been to Lit fests all across the world but there’s something about BLF that makes it very special” especially as it invites receptive audiences, encourages children through activities, and exposes the audience not just to authors but ideas. Chetan Bhagat wondered about the choice of a Literary Festival for Bangalore. He said that the IT city was perhaps better suited to organise a festival linked with Information Technology, Android applications or traffic! Ms. Binalakshmi Nepram chose to turn the focus to how much she valued BLF’s focus on the seven sisters this year. “For us the question of North East is about the making of India or is it India in the making? You’ve made us a part of the Indian consciousness and for that, I am proud,” said Ms. Nepram. Nepram, from Manipur, spoke about her transition from poetry to activism because of the atrocities against the people in her state and across the North East. She said that she was happy to be here and thankful for being included in the North-East portion of this Festival. The atrocities in this region have been largely ignored by the government and she hoped that this festival would help to change the mindset of people. Nepram remarked that Bhagat was mistaken about Bangalore being an IT City and said that it was actually a weapon-producing city with so many industries linked to waging war. Last year, she had come down to protest against the Aero India show and planned to do so again, next year. Shinie Anthony released the BLF magazine, “Bean Town,” and asked the audience to pick up their copies. The inaugural session concluded with Shraddanjali in the form of a documentary screening on UR Ananthamurthy. The festival is dedicated to his memory and the different venues for breakout sessions are named after Ananthamurthy’s masterpieces. Dancers performing Kamsala, a traditional folk dance of Karnataka.